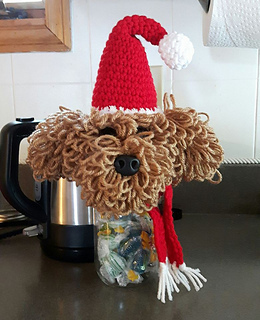 This pattern is meant to resemble the ever popular golden doodles and is designed to set on top a standard size canning jar (2 and 1/2 inch jar lid) as a decoration. 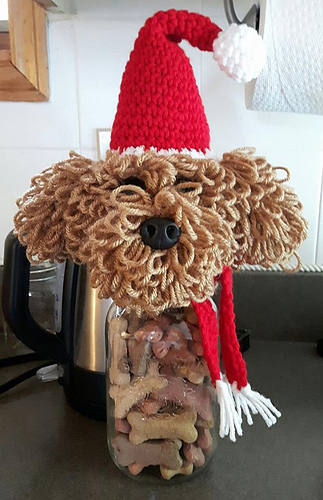 Fill the jar with your favorite treats, candies or even store your dog’s treats in it. They make great gifts for any dog lover especially the golden doodle dog. The pattern requires you to be familiar with the loop stitch as the head, ears and snout are entirely completed with loop stitch. There is a written explanation of the loop stitch described in the pattern, however, for those not familiar with this stitch it is a good idea to familiarize yourself through utube or crochet videos. It is not a difficult stitch, just takes a bit of getting the hang of. By simply doing 11 stitches of the scarf for 4 rows you can make a girly doodle with a bow in her hair.